Galley Wench Tales: Oz: Broome - Camel Rides & Other "Must-Dos"
Camel trains on Cable Beach at sunset; quintessential Broome -- at least for most tourists. Western Australia. 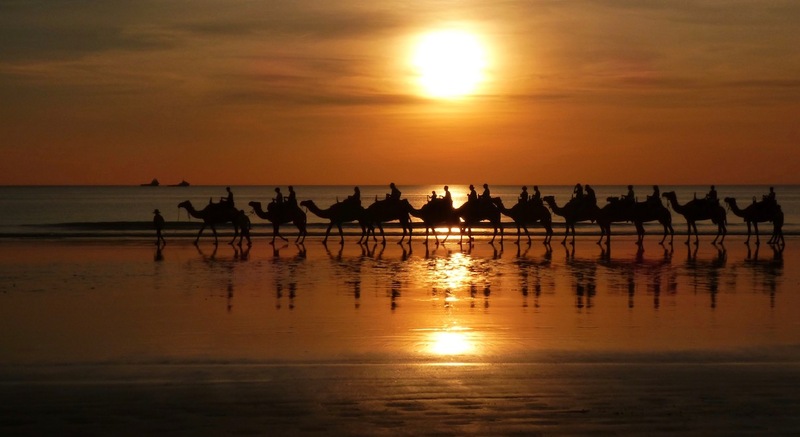 These days, tourism is Broome's economic lifeblood. The tourist season really picks up with the official start of the dry season, in May. As a result, in April, when we arrived, not all attractions are open. That's probably a reasonable trade-off for getting here before the crowds. The Broome area is far more multicultural than what we've encountered elsewhere in Australia -- surprising for a relatively small town in a moderately remote area. It's surrounded by Aboriginal communities. There's also a strong Japanese and Chinese cultural influence, in large part to Broome's former pearling heyday. I doubt Australia's shepherding Afghans and their camels were part of Broome's early post-Aboriginal immigrant culture. by their tails? It's a dung bag -- an attempt to keep them a little more tidy. Western Australia. This guy's job was to follow the camels and make all they left behind were footprint. Hard to get a s---ier job than that! "Personally, I’ve never much understood the allure of gallivanting about on a camel. They smell, they slobber, they’re toothy and they spit. Their gait is bumpy, their demeanour grumpy, their seat humpy and the one in front of me always farts too much." However, Taz did take the camel ride and I did and will not. 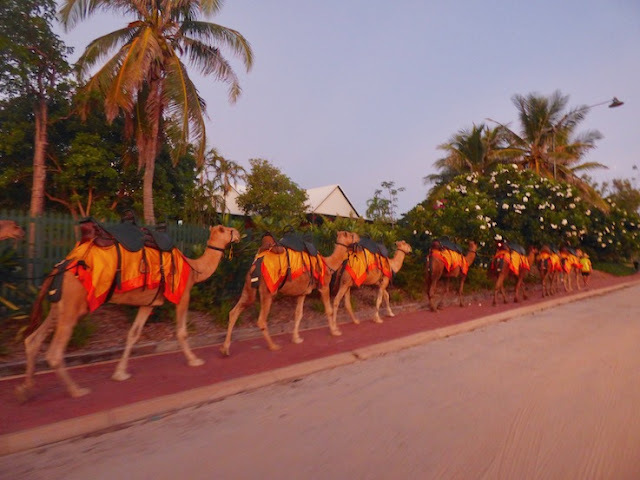 I put camel rides into the category of "you don't know what you're missing" can really only be truly true if you do choose to miss the experience. 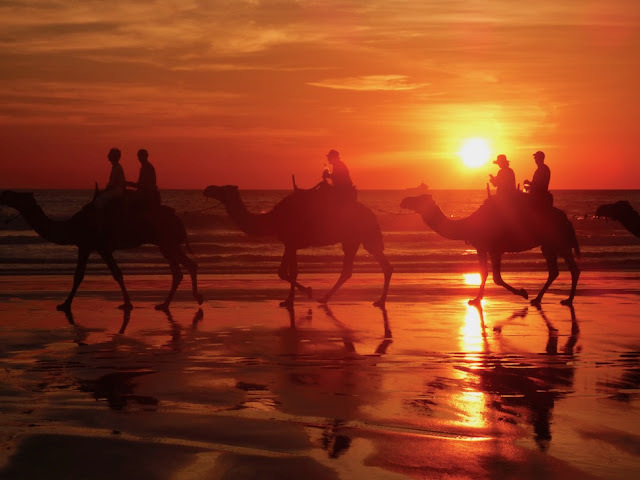 That doesn't mean I'm not still a sucker for wanting to get that trite-but-cool-even-though-everybody-does-it silhouette photo of camels caravans on the beach at sunset. Besides, Cable Beach is pretty darned nice. You can take your 4-wheel-drive on it -- which we did. 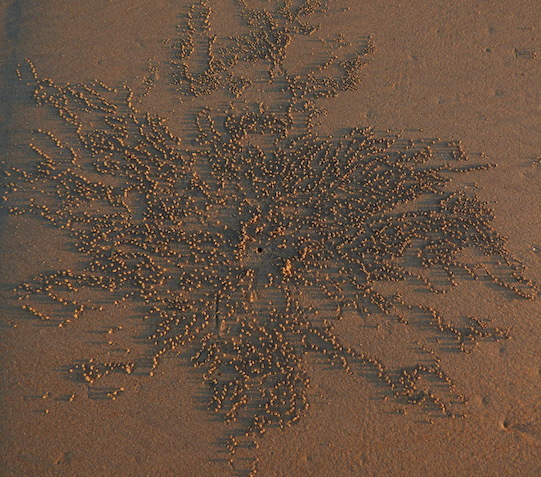 Telltale patterns left by ghost crabs on Cable Beach, Broome. Western Australia. Cable Beach is a long, broad, mostly firm, relatively white sandy beach that oh-so-gradually deepens. It invites wading, though between the threat of jellies (irukanjis, which are tiny enough to be hard to spot and seriously bad news and while not currently an epidemic here now, we heard there had been some recent incidents) and "salties" (crocodiles), kept me from embracing it as whole-heartedly as I normally would. The fact that no one else on the beach on our first trip there was sticking a toe in gave me pause, even though the day was hot and sunny, and the water temperature was pleasant. Not only were the camels great fun to watch, we got a kick out of watching a couple attempting to teach their two dogs to surf. On our second trip to Cable beach, this couple and their surfing dogs were the only folks we saw in the water. Broome, Australia. Best of all, camels or not, the sunsets were spectacular! We even saw a "green flash," a more commonly visible phenomenon now that we're officially back in the tropics again. However, if camel rides are your thing, there are several companies who offer them, Sundowner, Broome Camel Safaris, and Red Sun Camels. Their longer ~45 min/1 hour sunset rides cost $85-90 AUD for adults, less for kids and less still for "lap sitters." Camel dismounts didn't look easy. Broome, Western Australia. but camels have the right of way. Broome, Western Australia. We're currently in Broome, Western Australia, population ~16,000 -- big enough for a two groceries --Coles, Woolworths, plus McDonald's and Dominoes. We returned for one last night to check out Broome's "Staircase to the Moon," an event that happens 6 times a year. Right time, right place, wrong weather. But we enjoyed a stroll at the night markets there for the event. After Broome, weather permitting, we're bound for Darwin and the Northern portion of the Kimberleys and El Questro. Our route from here until when we leave Australia is still up in the air. 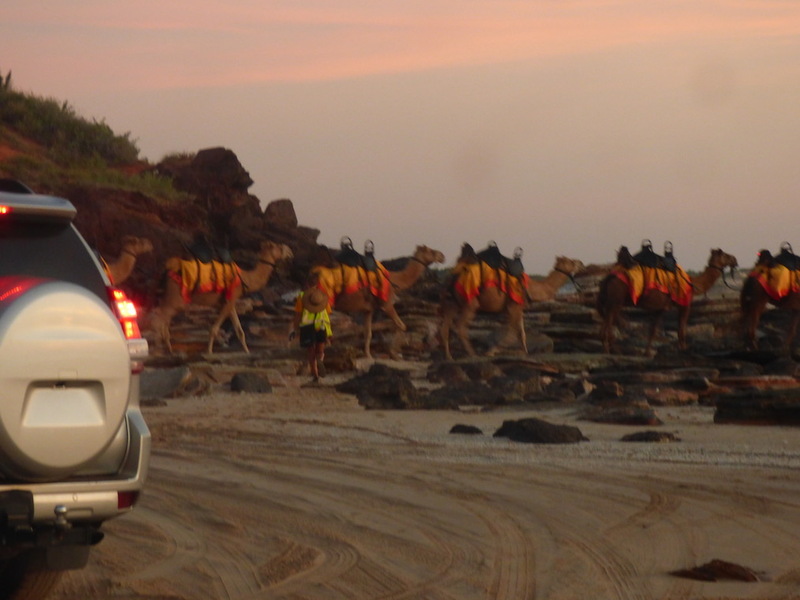 Camels at sunset on the beach, Broome tourism at its surreal best. Western Australia.